I don’t normally do Royal occasions. I think the only sensible approach in British history regarding the monarchy happened back in 1649, with the execution for high treason of Charles I, though I don’t approve of beheadings. Just a shame that the Commonwealth went wrong and the monarchy was restored. I also don’t like royal occasions because of the gawping and fawning crowds, and also the security that surrounds them. And opportunities for photography, except for a privileged few, are often rather limited. So May 27th this year was the first time I’ve ever been in London for the State Opening of Parliament. I hadn’t gone to photograph the Queen, but some of the friends I’d made covering the protests against ‘poor doors’. Class War had decided to protest at the event. It wasn’t the best planned of protests, and they had perhaps not realised the enormous level of policing that would be applied to ensure that the right to protest was denied to anyone in the area on the day. Quite why the Queen should be granted this level of immunity from protest isn’t clear. But one group of protesters I was with was stopped around 50 yards from the royal route, and then were escorted away and followed closely by police for the next couple of hours. 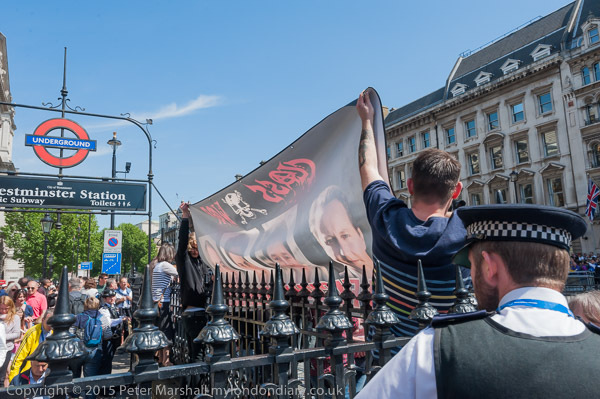 A couple of others were more successful, managing to display the Class War political leaders banner for perhaps half a minute on the actual route – though a quarter of an hour before she came down it. Police jumped on them rapidly, forced them to take down their banner and made sure the moved away. After a while Class War decided to make their way to a nearby pub. They were followed by at least twice as many police who stood on the opposite side of the road watching and were still there an hour later when I left to go elsewhere. 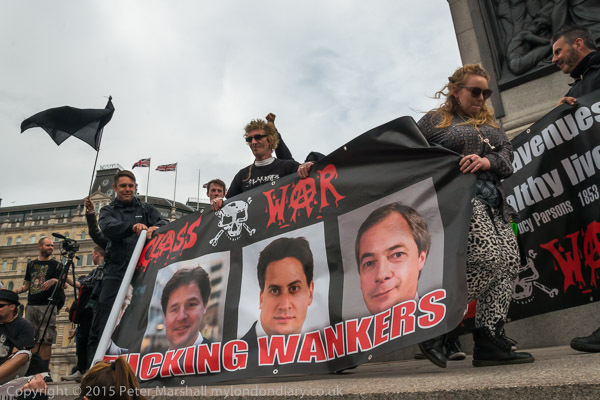 More about it at Class War protest Queen’s speech. 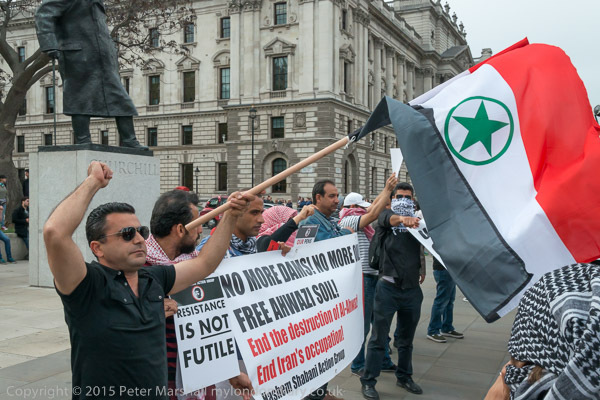 Here, well away from the Queen, a protest was taking place, but very differently. 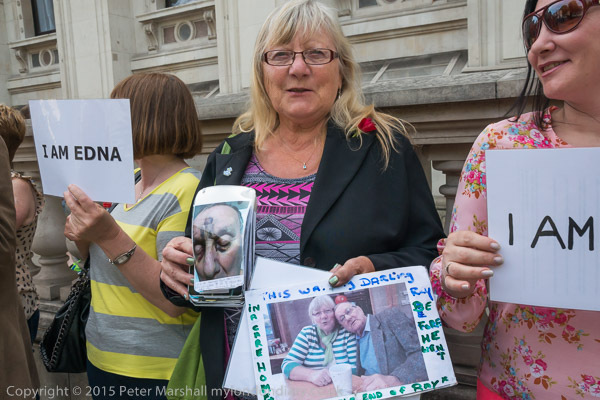 The organisers of ‘I am Edna’ – protect whistle-blowers had applied to the police for permission and had accepted the limits they had set for the protest. I think these included not using amplification of any kind, staying in one place and not handing out leaflets. Most protesters would find these unacceptable. I continued on my way to Trafalgar Square and sat down to read a book while I waited for the next protest. But soon I looked up and saw that some Class War people had come to the square and were standing close to me. There were now only two police officers watching them from about 20 yards away, even though they were only standing around in the square. Suddenly we noticed another small group of police had arrived and were surrounding a man, questioning and apparently arresting him, and people rushed across to find out what was happening. Police pushed those asking questions away and refused to say anything about what was happening, and a larger crowd of those waiting in the square for a further protest soon gathered around. More police came, and the man was marched away followed by a large group of protesters to one of the many police vans now around the area in Northumberland Avenue. A young man standing there was roughly pushed aside by an officer, and when he objected was arrested as well. 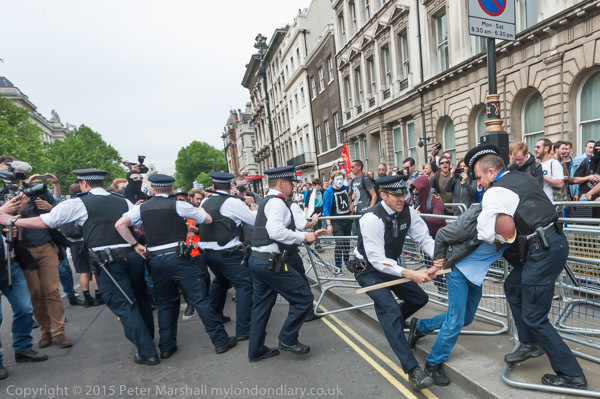 By this time, surrounded by an angry crowd, some of the police realised that they needed to explain their actions, and eventually we found that the man arrested first was not being taken for anything connected with the protest but for an earlier offence elsewhere. 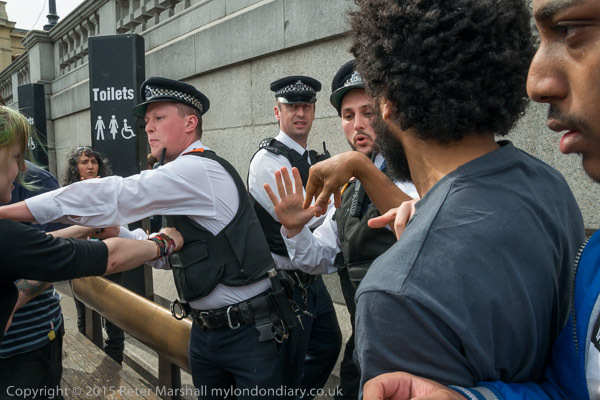 Had that been made clear earlier the situation shown in Police arrest man in Trafalgar Square, including the second arrest – could have been avoided. Next we heard loud music, and ran across the square to find a mobile disco and people dancing. 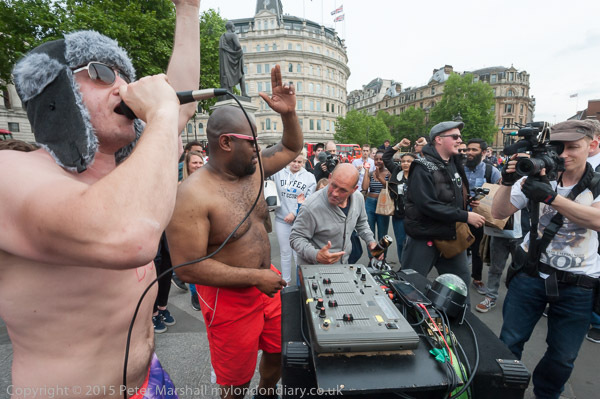 Disco Boy had come to play Trafalgar Square as an unsolicited warm-up act for the student protest expected shortly. I followed him and the dancers until he left the square, going on to play in Whitehall and outside Downing St.
More noise told us that the student rally organised by the National Campaign Against Fees and Cuts, NCAFC, was beginning, and all those who had been waiting around the square for this hurried towards the plinth of Trafalgar Square. Class War had come to support them and took their place on the plinth with them, getting huge cheers when they unrolled their new political leaders banner, along with several others. The NCAFC perhaps felt a little upstaged by this, and by others who joined them on the plinth, the Hashem Shabani Ahwazi Arabs, and although there were several speeches by student leaders, it felt a little downbeat. But the rally was only a prelude to the NCAFC March against ‘undemocracy’ which soon started off down Whitehall towards Parliament. Police formed a line across just before Downing St, but officers were too spread out and it would hardly have stopped a Sunday School outing, with students soon pushing past. The police made a more determined effort to stop the marchers lower down in Parliament St where barriers had made the road narrower, with some parked police vans. A few students were pushed to the ground by police and held, but many of the students simply did as I did and walked by on the other side of the barriers. After a few minutes – and a little posing with batons and some arrests – police realised they had failed and withdrew, continuing to follow the protest as it went through Parliament Square and up Victoria St.
I’d more or less loss interest and stopped to record yet another protest as the Ahwazi Arabs had left the march in Parliament Square to call for an end to the Iranian attacks on their heritage and identity in their homeland which was occupied and incorporated into Iran in 1925, mainly because of its rich oil fields. I ran on to find the NCAFC marchers again, and caught up with some of them marching back towards Westminster along Petty France. They protested briefly outside the DWP in Tothill St but a line of police diverted them from the Conservative HQ around the corner and they came back through Parliament Square to go up Whitehall and protest outside Downing St. 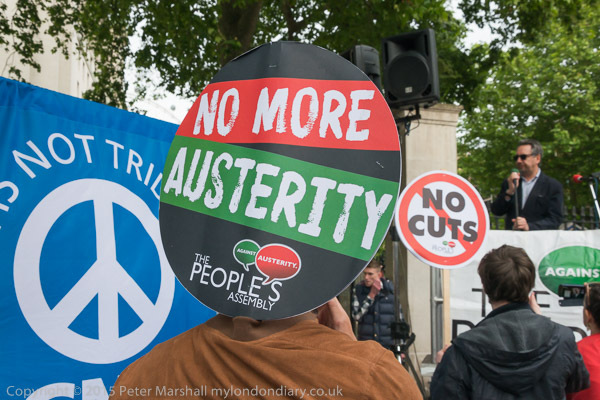 It was unfortunate – though not unexpected – that the People’s Assembly had decided to organise their own End Austerity Now rally at the same time as the NCAFC march. But when that march stopped outside Downing St, the People’s Assembly rally was still going strong and I went across to take pictures there for a few minutes. Visually it wasn’t exciting, just people standing around, few of them with placards or posters, listening to speakers. Most of them were saying things we’d all heard many times before, and most of the audience could probably have gone up and made the same speeches. I amused myself a little in the image above lining up the circular symbol and placards like some gear train in a machine, imagining it was generating the speech that John Rees at right was producing. When I made it back across the road the rest of the NCAFC marchers had arrived, and within a minute or so they started to leave, intending to go up the Mall to Buckingham Palace. I turned in the opposite direction; the light was fading fast and it had been a long day, covering eight stories, and I had much work still to do on them. This entry was posted on Sunday, September 6th, 2015 at 09:29 pm and is filed under My Own Work, Photo Issues, Political Issues. You can follow any responses to this entry through the RSS 2.0 feed. You can leave a response, or trackback from your own site.